They say music soothes even the savage beast. In the case of the HTC Sensation XL, it just makes it cooler. The Sensation XL shares its design and mammoth 4.7" screen with the Titan, but the XL is part of the Android squad and packs a lyrical iBeats headset. The Sensation XL uses almost exactly the same hardware as the Titan - the major difference is that the XL packs four Android capacitive keys and there's no hardware shutter key, but that's about it. The single Scorpion core in the Snapdragon chipset runs at 1.5GHz again and the camera is an 8MP unit that records 720p video. Even the screen is the same 4.7" WVGA S-LCD unit, not the qHD resolution of the Sensation XE. Here's the list of pros and cons to sum up how well the merging of Titan hardware and Sensation software went. 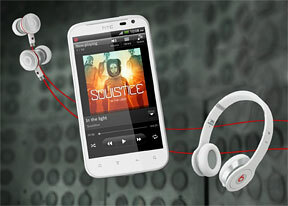 One major addition to the Sensation XL that the Titan lacks is the Beats setup. It includes a Monster iBeats headset in the box (those are rather pricy if you have to buy them separately) and special audio processing done on the inside tuned by none other than Dr. Dre. Compared to the other Androids by HTC (or in fact most other phones), the bigger screen of the XL is more accommodating to web browsing, watching videos and reading ebooks. The more screen real estate should be better for games too - if the Adreno 205 GPU is up to it (it's getting old, but should still be OK with most games). Well, time to pull out the lauded iBeats headset out of the box and give them a listen while we tour the hardware of the HTC Sensation XL. How do u make video calls? I press video call, but says no recipients available or something...help!